As part of our Holy Week havdalah, we went to the Great Vigil of Easter service at Episcopal Church of the Ascension (click here for the bulletin). It was so good to see the altar cloths and other moveable furnishings replaced, after having seen them stripped away at the end of the Maundy Thursday service and absent at last night’s Good Friday service. How much more so, to see them transformed into the Easter versions – spring flowers, multi-colored and metallic ye olde tapestry cloths and vestments, special candles, the handmade “He Is Risen” banner. We gathered inside and were all given candles, then went out to gather around a little Weber grill on the front walk, where the priest kindled the new fire and lit the Paschal Candle; he led us back in in three stages with a versicle and response, and our candles were lit as we went. The way it was woven of threads from the other Holy Week services, plus new and old ones. The vigil and transformation concepts and themes, especially their relationship with trans* people – putting me again in mind of the international Transgender Day of Remembrance (November 20th), including the use of individual candles. The individual candles also reminded me of our and other Christmas services, and those felt more recent and related than ever before. I also thought about how the Apostles couldn't stay up with Jesus on the eve of his death, and yet we stay up with him tonight. And of the Pesach seder: Why is this night different from all other nights? The tapestry of the altar cloths depicts ye olde urns and flowering plants, but it also looks like hot air balloons, and their 1980s revival was part of my childhood – mostly symbolically, though we did see them in person at least once when visiting the part of my mother’s family that lived in the Southwest. The little white plastic holders for our individual candles made them look like small Unitarian Universalist flaming chalices (the primary symbol of that tradition and Association). There were many explicit and implicit connections between Judaism and Christianity (my faiths) – Passovers, Diasporas, candle-lighting, Cantors and more. As in Jewish community, I was particularly mindful of people all over the world doing this same thing at this same time. We were read Genesis and Thanksgiving Over The Water – both especially relevant as Earth Day is this coming Tuesday (April 22nd); the latter begins “We thank you, Almighty God, for the gift of water. Over it the Holy Spirit moved in the beginning of creation.” And Genesis is central to trans* theology for many Jews, Christians and others: “So God created humankind in his image, in the image of God he created them; male and female he created them.” – it’s even better when better translated. “O God, who wonderfully created, and yet more wonderfully restored, the dignity of human nature…” (the beginning of a contemporary version of a Collect from the Book Of Common Prayer) – doesn’t / can’t this happen to each of us, many times, during our lives? If we let it -- if we meet it. Being challenged for the second time this week by the story of the Red Sea (Exodus 14:10-31, 15:20-21), especially God’s hardening the Egyptians’ hearts when they wanted to stop oppressing the Israelites – as He had done to Pharaoh not long before. Also, it turns out that Ascension has a tradition of giving baptisees a white taper candle at the end of the ritual. And now, a few more photos. 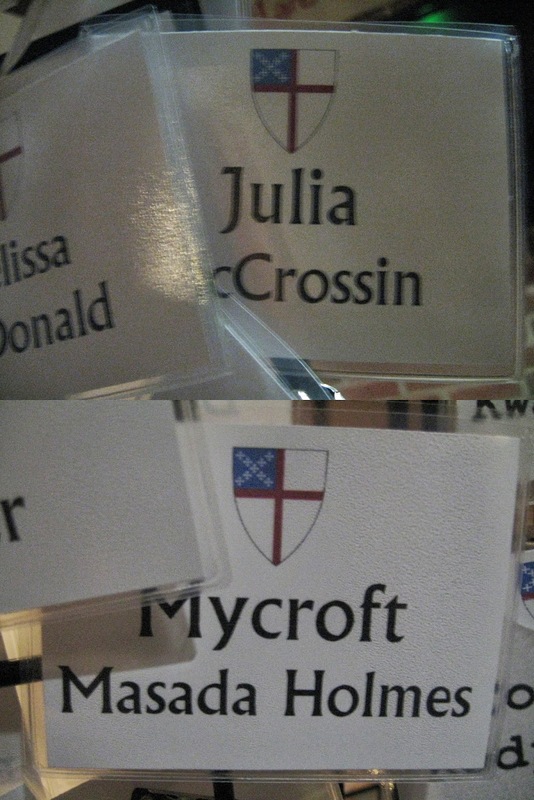 They made our nametags! Our first ones here. We’ll wear them tomorrow. The little BBQ we used for the new fire and candles, waiting the Altar Guild to come and collect it.